Designing beautiful fabric doesn't have to be difficult. It can be as simple as sketching a few of your favorite drawing tools–like crayons! 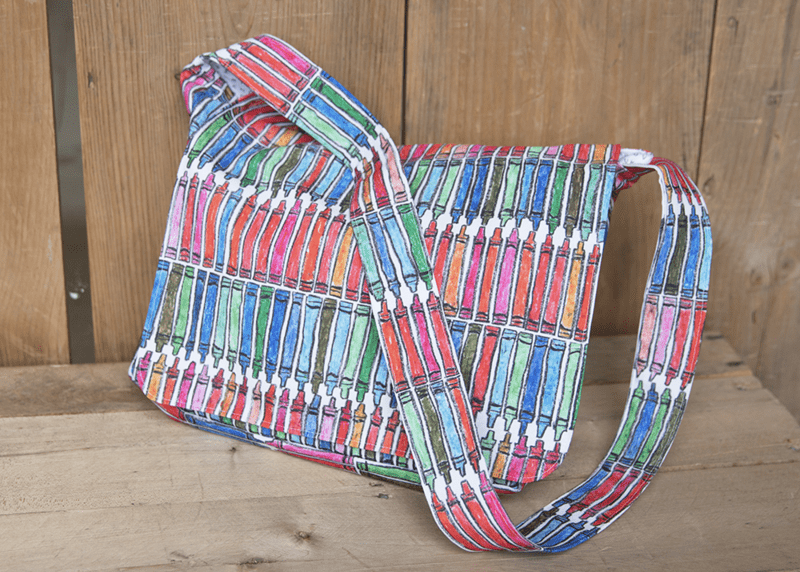 In today's tutorial, Candy Joyce shares how to create a quick crayon design and use it to stitch up a functional messenger bag–perfect for back to school! Raise your hand if you’ve ever said, “I’m not an artist; I can’t design fabric.” Despite being fearless with a sewing machine, designing fabric seemed a little intimidating and I worried that I didn’t have the artistic skills. Then I read Candy Joyce’s tutorial for creating my own crayon inspired fabric to sew into a cute messenger bag. Her easy to follow instructions gave me the confidence to treat myself to a brand new box of crayons and rediscover that childhood artist hiding inside. Candy: For this project, I wanted to capture the happiness I felt cracking open a fresh box of crayons and spending the afternoon drawing and coloring when I was little. I usually design on my computer, so I had to get into a different frame of mind for this hand-drawn design; I had to be more thoughtful with my design decisions as there is no undo button on crayons. I would normally dive straight into the design and then spend time rearranging and recoloring things later; instead, I took my time at the beginning of the project to plan where my colors were going to go and how I wanted it to look.